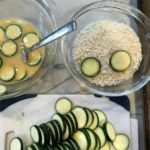 Zucchini Fries are an addictive and healthy alternative to french fries and they are really easy to make and sooooo yummy!! 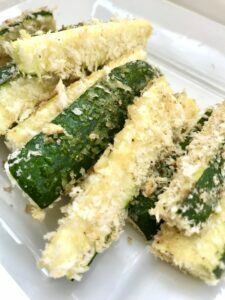 They are crunchy and salty on the outside, warm and creamy on the inside. 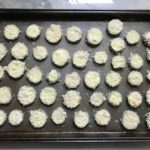 Oh, and did I mention that because they are baked, not fried, they are good for you too??? 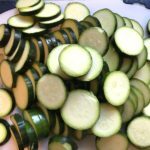 I made these years ago, but then for no good reason at all, they fell out of my life. 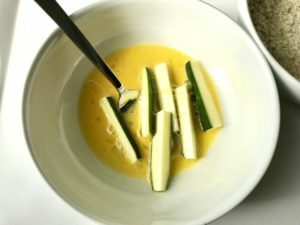 Then through a series of random circumstances, Zucchini Fries entered my life again. 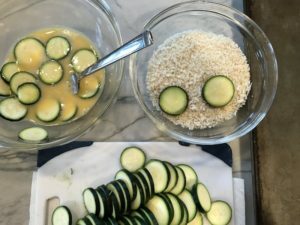 First, it was through a meal kit delivery meal, where I think they were paired with a burger. 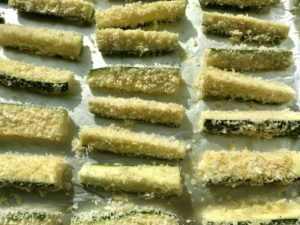 Second, it was at one of my new favorite restaurants in Jersey City, Kitchen Step, which has absolutely amazing small plates with one being these super addictive string-cut Zucchini Fries. 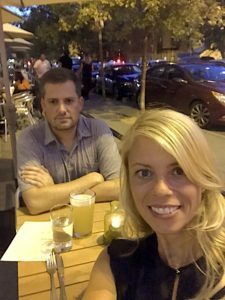 Here Dave and I are at Kitchen Step (Dave doesn’t smile until he gets his Zucchini Fries :). 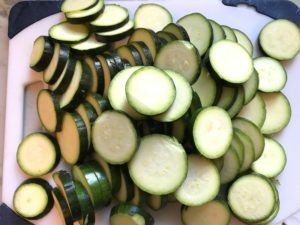 So, after these few interventions from the Zucchini gods, I took the hint and decided it was time to make my own again! 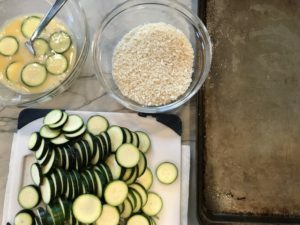 I tried a few different cuts of the zucchini, but because I wanted a healthier baked version, I needed a thicker cut that could hold the panko bread crumbs and withstand the oven high temperature. 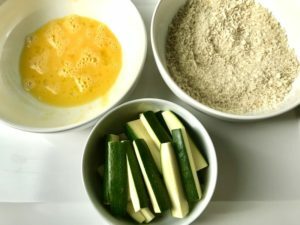 The ingredients are simple, Zucchini, panko bread crumbs, eggs, extra virgin olive oil, salt & pepper. 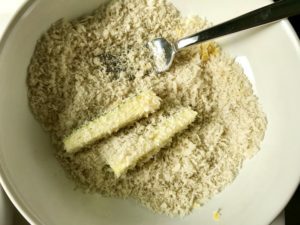 After you cut your zucchini, you coat it in beaten eggs, then dredge it in panko bread crumbs that are seasoned with salt & pepper. 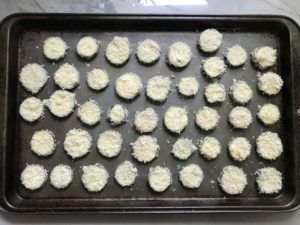 Then line them up on a sheet pan that has been coated with extra virgin olive oil. 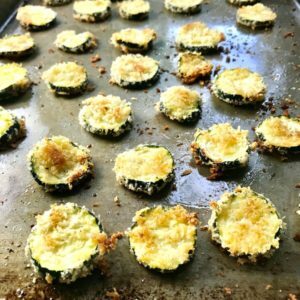 Put them into a 400 degree F oven and bake – that’s it! 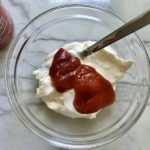 Then…comes…the…sauce! 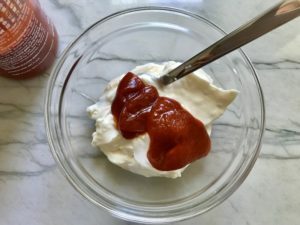 I love the sauce that Kitchen Step serves it’s fries with, which is a Harissa Mayo. 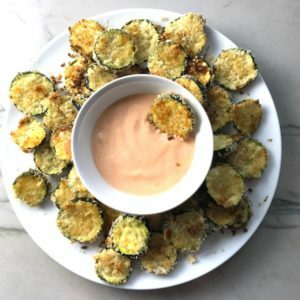 Harissa is a hot chili pepper paste and I love the combination of the mild, salty, crispy zucchini fries with a cool, spicy, and creamy sauce. 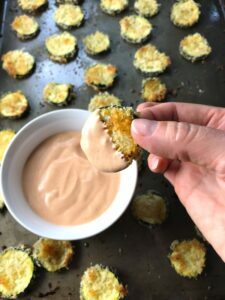 For my dipping sauce, I combine Sriracha sauce and Mayonnaise and that is a simply perfect combo. 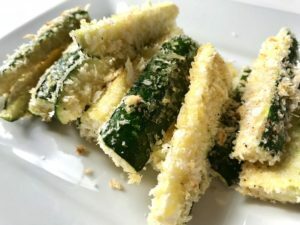 When the Zucchini Fries are done baking, you can serve them as a snack, an appetizer for entertaining, or a side dish. 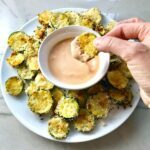 Dip them into the Sriracha sauce and I swear you will be in heaven! 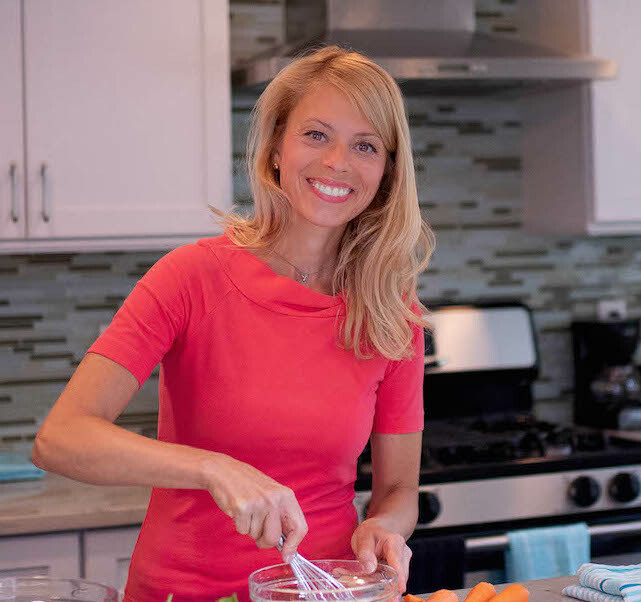 See the full recipe below. Enjoy!